An opera singer hits a high note and this shatters a glass in the drawing room. This may have appeared in the movies, but is it really possible to shatter glass with sound? Yes, but this is harder than you might think. To do it reliably for a science demonstration requires practice and careful choice of the glass and loudspeaker. It is quite nerve racking doing this live on stage, because it sometimes takes a bit of fiddling and tuning to work. This is great for building tension in the audience! There several videos on Youtube showing people doing this acoustically by placing glass right close to the mouth. This is dangerous and is liable to lead to shattered glass going into the mouth. If you watch the high speed footage above, you’ll see glass goes in all directions. People near to the glass and loudspeaker need to wear safety goggles and ear protection (ear defenders or ear plugs). The glass doesn’t normally travel far when breaking, but sometimes it is surprising how far the glass will go. Typically the loudspeaker produces about 100+ dB for someone close to the glass, therefore hearing protection is needed for those close-by. We accept no responsibility for people trying this experiment, it should be left to the professionals. How is the glass broken? A glass has a natural resonance, a frequency at which the glass will vibrate easily. Therefore the glass needs to be moved by the sound wave at that frequency. If the force from the sound wave making the glass vibrate is big enough, the size of the vibration will become so large that the glass breaks. What glass should be used for the demo? We use large red or white wine glasses with thin walls. The glass must have a very strong resonance. When you ping it with a finger it should ring easily and for many seconds. The best way to find the right glass is to go to a shop with lots of glasses and go around gently tapping them! This indicates a glass with little damping. Damping provides a force that acts to stop objects vibrating, so we don’t want that. We need a strong resonance, because then it is possible to force the glass to vibrate with a big enough displacement to break. The glass should also have a very simple shape and not be embossed. What loudspeaker should you use? Conventional loudspeakers don’t work. The problem with using a normal loudspeaker is that you excite the glass in a very inefficient way. The diagram below shows the vibration mode used in breaking for the glass viewed from above (you can also see this type of deformation happening in the video as well). 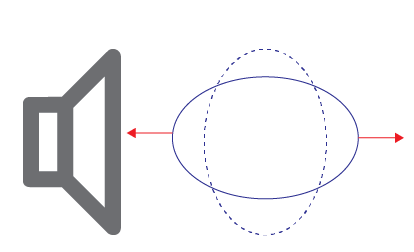 The loudspeaker needs to distort the glass so that opposite sides of the glass are moving in opposite directions as shown by the arrows. However, the wavelength of sound in air is much greater than the size of the glass. For the glass we use about eight times bigger. This means if we apply a sound wave of 2 Pascal (100 dB), the force pushing the glass apart is only about 0.3 Pa. This is why the excitation is so inefficient. 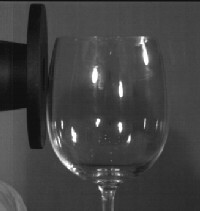 Loudspeaker and glass showing showing the ovalising mode. A compression driver can help overcome this. This is a loudspeaker with a very small diaphragm, which along with a small tube can be used to direct the sound onto one side of the glass. Most compression drivers come with a range of adapters, and so you can use one of these as the small tube. The right side of the glass is now shadowed from the sound emerging from the loudspeaker by the rest of the glass. Consequently it is easier to break the glass because the sound on the right isn’t hindering the vibration of the glass so much. 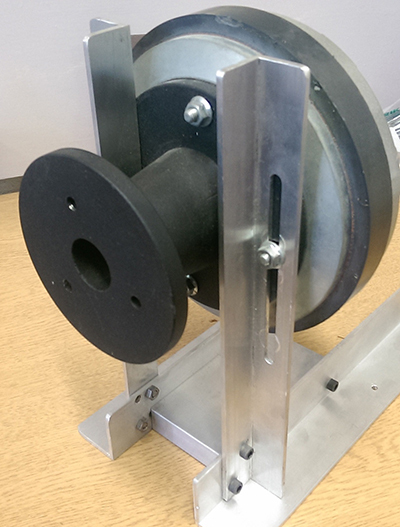 We used a Fane CD280 compression driver, but many different companies make suitable devices. You’ll need a 2″ compression driver because the more normal 1″ designs probably don’t go to a low enough frequency for a typical large wine glass resonance. Make sure you also get some spare voice coils as you’ll probably break a few experimenting! You’ll also need a powerful amplifier, ours is 300W per channel. You need to send a note to the driver that has the same frequency as the resonant frequency of the glass. This could be a pure tone from a sine wave generator, or alternatively it can come from an opera singer (via a microphone). We’ve even done it with an electric guitar for Richard Hammond. If you do use a singer or musical instrument, you’ll need to apply a bandpass filter so you don’t send a signal to the loudspeaker outside its normal bandwidth (you risk blowing the voice coil if you do). If you do use a singer, you’ll need someone who can hold a note at just the right pitch, hence a trained opera singer is good. As the sound is being amplified electronically, it is more important that the singer can get the right frequency and hold it steady than sing loudly. One of the secrets of breaking the glass is the resonant frequency changes a little as the glass vibrates with a bigger displacement. When you tap the glass to hear the resonant frequency, that is actually slightly higher (by a few Hz) than the frequency you’ll require. We start by tuning the frequency correctly at a low level. It is useful to have a visual indication that the glass is vibrating because the movement can’t be easily seen by the naked eye for small vibrations. In the video below, you can see a small folded piece of paper being used to show the resonance. Resonance appears in A-level syllabuses under simple harmonic motion e.g. AQA, Edexcel and OCR. Key Stage 3 Sound is produced by vibrating objects. Any experience of doing this demo? Top tips for those trying to get it to work? Please comment below.